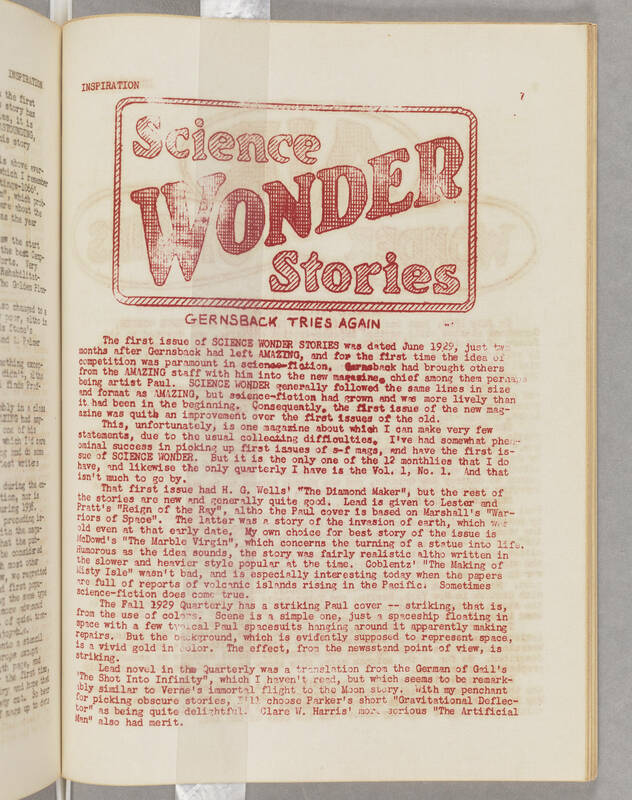 INSPIRATION 7 [in large letters inside box] SCIENCE WONDER STORIES GERNSBACK TRIES AGAIN The first issue of SCIENCE WONDER STORIES was dated June 1929, just two months after Gernsback had left AMAZING, and for the first time the idea of competition was paramount in science-fiction. Gernsback had brought others from the AMAZING staff with him into the new magazine, chief among them perhaps being artist Paul. SCIENCE WONDER generally followed the same lines in size and format as AMAZING, but science-fiction had grown and was more lively than it had been in the beginning. Consequently, the first issue of the new magazine was quite an improvement over the first issues of the old. This, unfortunately, is one magazine about which I can make very few statements, due to the usual collecting difficulties. I've had somewhat phenomenal success in picking up first issues of s-f mags, and have the first issue of SCIENCE WONDER. But it is the only one of the 12 monthlies that I do have, and likewise the only quarterly I have is the Vol. 1, No. 1. And that isn't much to go by. That first issue had H. G. Wells' "The Diamond Maker", but the rest of the stories are new and generally quite good. Lead is given to Lester and Pratt's "Reign of the Ray", altho [i.e. although] the Paul cover is based on Marshall's "Warriors of Space". The latter was a story of the invasion of earth, which was old even at that early date. My own choice for best story of the issue is McDowd's "The Marble Virgin", which concerns the turning of a statue into life. Humorous as the idea sounds, the story was fairly realistic altho [i.e. although] written in the slower and heavier style popular at the time. Coblentz' "The Making of Misty Isle" wasn't bad, and is especially interesting today when the papers are full of reports of volcanic islands rising in the Pacific! Sometimes science-fiction does come true. The Fall 1929 Quarterly has a striking Paul cover -- striking, that is, from the use of colors. Scene is a simple one, just a spaceship floating in space with a few typical Paul spacesuits hanging around it apparently making repairs. But the background, which is evidently supposed to represent space, is a vivid gold in color. The effect, from the newsstand point of view, is striking. Lead novel in the Quarterly was a translation from the German of Gail's "The Shot Into Infinity", which I haven't read, but which seems to be remarkably similar to Verne's immortal flight to the Moon story. With my penchant for picking obscure stories, I'll choose Parker's short "Gravitational Deflector" as being quite delightful. Clare W. Harris' more serious "The Artificial Man" also had merit.